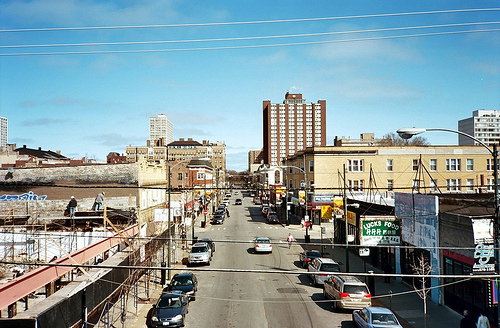 Question answered: When did Chicago’s Chinatown develop as a neighborhood? 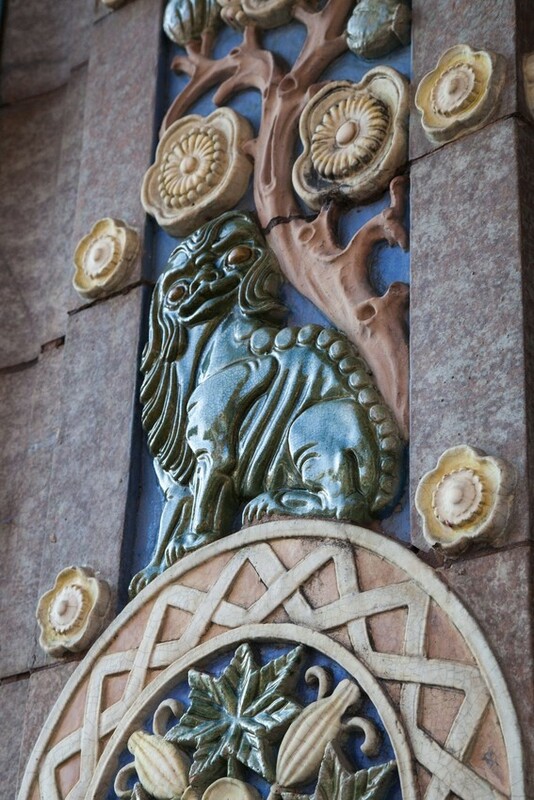 A detail of the Pui Tak Center's facade. 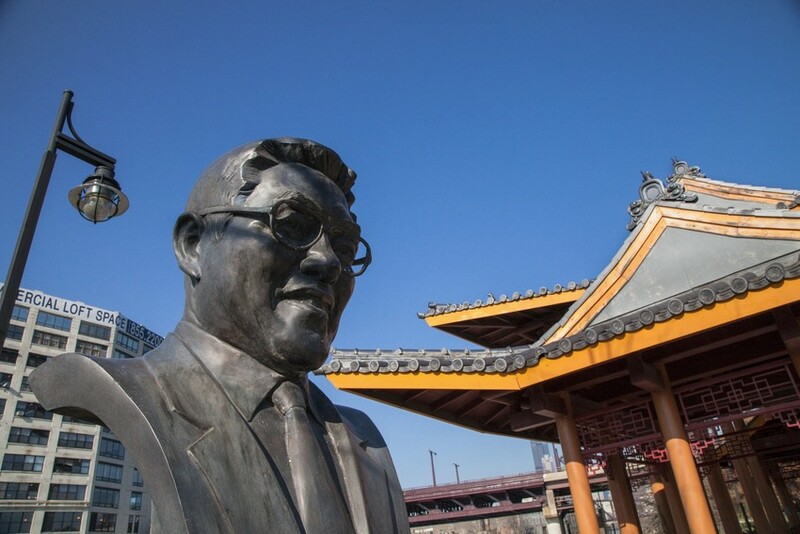 A statue of businessman and civic leader Ping Tom in the Chinatown park that bears his name. .
Chicago's Argyle Street Vietnamese neighborhood. When did Chicago’s Chinatown develop as a neighborhood, and is it still predominantly Chinese in ethnicity? Well, there are simple one-word answers to each of Monica’s questions, but where would the fun be in that? Besides, when you dig around the history of Chicago’s Chinatown, there are some great backstories. Monica’s question of when Chicago’s Chinatown came about is nothing if not timely. It turns out 2012 is the centennial of Chinatown’s current location on the South Side. Historians agree that it was around 1912 that a critical mass of Chinese businesses agglomerated along Cermak Road (then called 22nd Street), in an area that was known at the time as Chicago’s red-light district. But, as I said, there’s a backstory, and it’s this: Chicago’s first Chinatown actually started somewhere else. A stretch of South Clark, to be exact. “From Harrison and Clark all the way to Van Buren were of course older buildings, and there were a lot of stores and apartments where the Chinese lived,” explained Susan Lee Moy, a Chicago native and student of Chinatown’s history in Chicago. Moy and I recently strolled a few blocks along Clark Street in the South Loop, between Harrison and Van Buren Streets, where Chicago’s early Chinese arrivals first set up businesses and shared apartments. In fact, Moy’s own grandfather had an herb and curio shop on that strip, and her uncles were born in an apartment above it. These associations helped Chinese merchants get their footing and conduct business in Chicago. They also were involved in illicit trades, such as gambling, drugs and prostitution. At the time, the Chinese Exclusion Act largely kept Chinese women from entering the country, so the first Chinese in Chicago were mostly male. Today, the stretch along South Clark barely shows any vestige of a Chinese presence (See our slideshow above to see what’s there now), and the center of Chinese cultural and commercial life in Chicago is now on the South Side. So what happened? Specifically, it was the businessmen that belonged to the On Leong Merchants Association that relocated, despite the discrimination they faced. Moy explained that they had to buy property through third parties. “At the time, Chinese were not allowed to purchase property,” she said. Interestingly, if you go to Chinatown you’ll get an eye-full from a building near the big Chinatown gate at Cermak and Wentworth: the Pui Tak Center, which started going up in the early 20th century. The exterior is covered with colorful reliefs of phoenixes, peacocks, lions, and Chinese characters. The On Leong Merchants Association commissioned Swedish architects to build the center, which served as the group’s headquarters. Luk told me Pui Tak Center came to be known as the unofficial “city hall” of Chinatown. The Pui Tak Center was raided by the FBI and seized by federal authorities in 1988 in a gambling sting, but it remains the only historical landmark in the neighborhood currently known as Chinatown. However, that distinction does not necessarily make the building Chinatown’s oldest. Instead, Luk said, building records suggest an unremarkable three-flat graystone on Archer Avenue is the oldest structure that has remained since the On Leong Merchants Association set up on the South Side. Today, that building’s ground floor is home to a Chinese hot pot restaurant, but otherwise its exterior bears no discernable connection to Chinese-American culture. Monica had a good follow-up, namely whether Chicago’s Chinatown is, um, “Chinese” in name only. Well, perhaps a good reason for Chinatown’s century-long stay on the South Side is the fact that it’s more than just a commercial hub for Chinese-Americans; it also serves as home for many of them, too. “The majority of the residents here are still first-generation immigrants or seniors who have been here for a long time,” said Luk. The total population of Chinatown, which falls in Chicago’s Armour Square Community Area, increased more than 11 percent between 2000 and 2010, according to U.S. Census data. This is notable, considering the overall population decrease in the City of Chicago during that decade, and much of the growth has been attributed to a continued flow of Chinese immigrants to that hub, where immigration and language assistance centers are easily accessible. A demographic analysis of Chicago’s community areas by immigration researcher Rob Paral shows that more than 72 percent of Armour Square’s population in the 2010 Census was Asian-American. The majority of that is Chinese-American. While Armour Square has the densest concentration of Chinese-Americans in Chicago, the population is spreading to adjoining communities. In particular, Bridgeport and McKinley Park are home to thousands of Chinese-Americans, and they were included in the “Greater Chinatown Community Area” that Chinese-American advocacy organizations defined last year in their attempt to consolidate most South Side Chinese-Americans into a small number of legislative districts. After several years of registering voters in the extended Chinatown area, and lobbying local and state representatives, groups such as the Coalition for a Better Chinese American Community successfully had state representative district lines redrawn to place about 90 percent of Chinese-Americans into one state-level representative district. Previously, they argued that their voice was diluted by splitting the Chinese-American among four state representatives and three state senators. Their political effort also helped the Chinatown community win city funding to rebuild a lost asset: a field house in Ping Tom Memorial Park. The park’s field house was torn down five decades ago to make room for an expansion of the Dan Ryan Expressway. Community organizers have lobbied recently to raise the issue with city officials, and they now look forward to having a recreational space for youths. A kicker: What about that other Asian part of town? The answer here goes back to that rivalry between the On Leong Merchants Association and the Hip Sing Business Association from Chinatown’s early days in Chicago. After the On Leong faction relocated from the South Loop to the South Side, the Hip Sing stayed on Clark Street for several decades more. But in the 1970s, those businessmen decided they, too, needed to leave, so they relocated to the North Side’s Uptown neighborhood. Luk said they hoped to build a second Chinatown along Argyle Street, but the effort sputtered until the fall of Saigon in 1975, when waves of ethnically-Chinese refugees arrived from Vietnam. Many of those who had means settled in the neighborhood and opened businesses, lending the area a more Southeast Asian flavor. Now, the ethnic identity of that part of town has become entrenched much like Chinatown’s has, with the establishment of several refugee and immigration services to help new arrivals from countries in that part of the world.